Barrett Station Shade Garden. 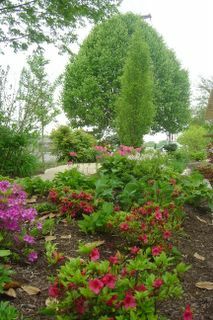 Note azaleas blooming and hostas in the background. Take the time and walk the two specimen gardens at the garden center. No other garden center in St. Louis has display gardens of this magnitude. Come to think about it.....Have you ever seen a display garden at the Big Box Hardware Store/garden center? How can they call themselves garden centers is a mystery to an Independent Garden Center.